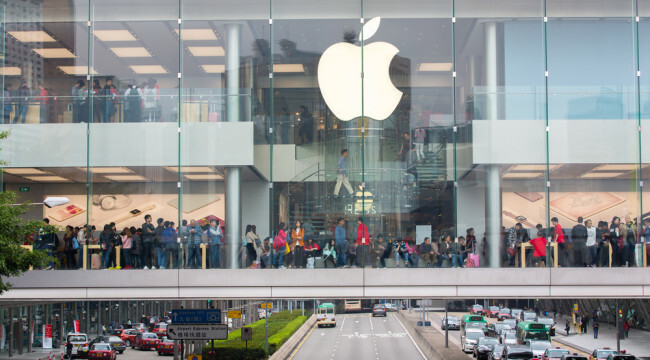 Is It Time to Buy Apple? He asked if he could share the power outlet I was using. I said “sure”… as long as he agreed to take a picture with me. He then smiled widely and noted with appreciation my iPhone. 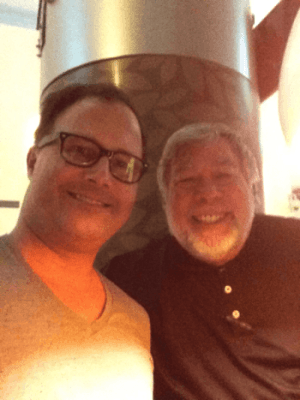 To my surprise, it was Steve Wozniak, co-founder of Apple Inc.
Wozniak basically created the hardware and software for the first Apple computer. No Wozniak, no Apple or Steve Jobs. I thought about my fluke encounter on Monday as a surge of Apple euphoria hit the markets. News broke that “Big Daddy” Warren B., the world’s most famous investor, had placed a massive bet on the tech giant’s shares. Is it time to buy AAPL? Apple fan boys’ hearts fluttered Monday with Buffett’s Berkshire Hathaway buying $1.1 billion of Apple stock. It quickly jumped $3.36 to $93.88, in response to Berkshire’s bold buy. Buffett’s Apple play may be a huge stake for mere mortals, but it’s chump change for him. His big trades can go for $10 billion and up. Well, Buffett’s always thought of as a classic value investor with a well-known aversion to tech. He believes that tech economics is far beyond even his legendary investing acumen. Instead, he focuses on companies that operate in stable and certain environments… the exact opposite of the tech sector. I would not be at all surprised to see them be worth a lot more money 10 years from now but I would not buy either one of them. First, Apple shares have declined big, down from more than $132 per share in July 2015. Recently, the tech giant posted its first quarterly sales decline in 13 years. Buffett and his value-investing cult believe that Apple is now trading below its fair market value. It’s “cheap”… an industry leader with stable management… has massive cash flow… has a massive global customer base… and has best-in-class products. In short, the world’s quintessential tech growth stock now has fundamentals that the world’s quintessential value investor likes. Is Warren Right About Apple? Who the hell knows. Fundamentals don’t mean squat to me or any other true trend follower. Buffett could be 100% right. Apple may be cheap. Its sales decline could be a temporary setback. And its share price could zoom up and touch the sky from here. Or Buffett could be dead wrong. Apple’s glory days may be behind it. Its competitive advantage may have fizzled. And its shares may only get a lot cheaper from here. Buffett’s been wrong before. He famously lost 55% on his bet on oil producer ConocoPhillips (NYSE:COP) in 2009. The point is nobody knows the future. Not even Warren. That’s why I don’t pay any attention to his bets… the breathless media… or Apple’s fundamentals. The only “data” I need to know to make money is whether Apple’s share price is trending. And as of today, it is not. If you want to join the cult of Buffett hero worshippers and jump on the Apple train because you trust “Big Daddy,” feel free. The media will blow sunshine in your ear and support your decision. Then and only then will I bet on Apple. You see, I don’t believe in mediums. Not even wildly wealthy Warren Buffett. The notion that you can know enough fundamentals about Apple, Google or any other tech stock to predict its future is preposterous. They only thing they have in common is price. Market prices are objective data. And the safest and most effective way to trade any stock is to trade individual price movements. Today, Apple’s price movement is telling me to stay on the sidelines. Please send your comments to me at coveluncensored@agorafinancial.com. I want to know what you think. Today, Jody Chudley explains how Warren Buffett capitalized on Canada’s new “anti-capitalism” regulations… and how you can follow his lead.